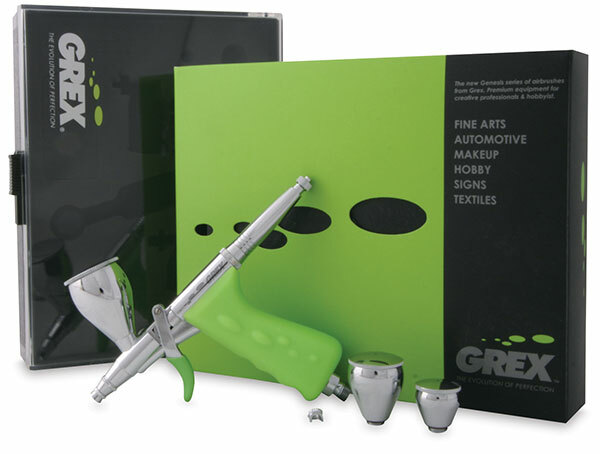 Grex Tritium airbrushes represent a premium line of double-action pistol-style trigger airbrushes. Their intuitive, easy-to-use design appeals to beginners, yet their fine detail control and comfortable operation make them a good fit for professionals as well. This comprehensive, feature-packed line of airbrushes accommodates a variety of airbrushing preferences — top or side gravity, left or right handed, big or small reservoir, fine or wide spraying. Grex Tritium airbrushes come in two forms — Tritium.TG, a top-gravity version and Tritium.TS, a side-gravity version. Each version is available in three different models with 0.2 mm, 0.3 mm, or 0.5 mm nozzle sizes. The features of the Tritium.TG and Tritium.TS are identical, except for the feed type. The nozzle size on any of the Tritium airbrushes can be changed with optional conversion kits, which are not included. Nozzle Conversion Kits offer an option to modify any Tritium airbrush to a 0.2 mm, 0.3 mm, or 0.5 mm nozzle size. The double-action pistol-style trigger is an intuitive, easy-to-use, and comfortable trigger system that offers fine control from detailed to wide spraying. It feature two-stage operation; the first half of the trigger motion controls the air and the second half controls the paint volume. Its ergonomic handgrip is a pistol-style with a textured surface that offers a firm and comfortable grip, helps minimize hand fatigue and cramping, and allows individuals with chronic finger or hand issues to airbrush more comfortably. A high-performance nozzle design features a fine thread screw-in design for precise nozzle centering. Constructed of stainless steel with large diameter threads for extra durability, nozzles are precision-machined for optimal paint flow through the nozzle and optimal air flow around the nozzle. A high-performance needle design has a long taper at the needle tip to provide superior fine paint volume control. It is precision-machined from stainless steel for a durable, matched fit to the nozzle. A pre-set adjustment knob allows for precise paint volume control and adjustments. A dial limits the paint volume for an easy way to create consistent spray patterns — or dial it all the way back for full trigger control. The patented design of the Quick-Fit needle makes the needle easy to attach and remove, yet remain securely in place when you need to protect the airbrush needle tip. The Quick-Fit crown needle cap has cut-away sides that provide improved air flow when spraying close to the work surface so that fine detailed patterns can be achieved. The Quick-Fit needle cap storage offers quick access for either of the Quick-Fit needle caps when not in use. Other features include an internal mix design for fine atomization and a smooth finish, solvent-proof PTFE seals that are replaceable and accept most paint media, chrome-plated housing for durability and ease of cleaning, and a short paint passageway from reservoir to nozzle tip for a responsive feel. ® Grex is a registered trademark.™ Quick-Fix is a trademark.